Axor Citterio M embodies the fine art of timelessly modern design. The strikingly slender shapes and the unique elegance of the mixers integrate seamlessly into lots of different style worlds. The wealth of variants in the comprehensive bathroom collection offer you plenty of combination options for selection and planning. 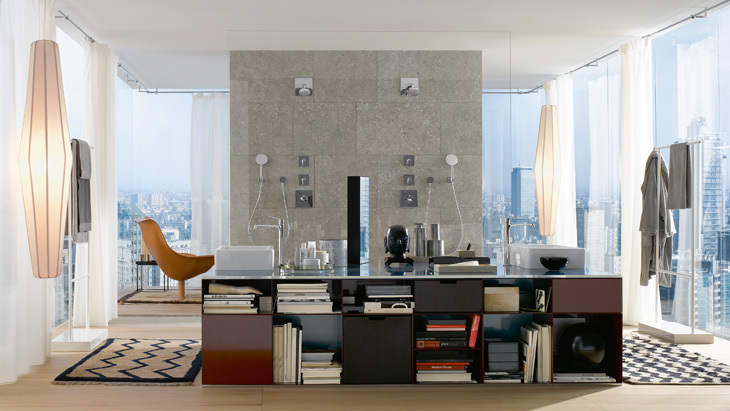 Rely on Citterio M, a collection full of clarity and inspired by modern city life: “M” as in modernity, metropolis and Milan - the home city of the designer Antonio Citterio. As well as products for bathrooms, bidets, bath tubs and showers, the collection also includes striking single lever mixers for the kitchen. Axor Citterio M basin mixers are available as single lever mixers in various heights and also as 2-hole and 3-hole mixers. The basin mixers are particularly elegant when combined with free-standing wash bowls. Space-saving concealed installation wall mixers are available as 2-hole or 3-hole variants with two spout lengths. For shower and bath tub, you have a choice of exposed and concealed mixers and thermostats. You can also use lots of Axor Citterio M products with ergonomic star-shaped handles. Lightness and elegance are also hallmarks of the showerpipe from Axor Citterio M. The combination of overhead shower with three different jet types, an exposed thermostat and a hand shower represents showering luxury. The range for the shower is supplemented by matching overhead and hand showers, which can also be combined with a side shower. The numerous accessories available from Axor Citterio M enable you to offer your customers matching additions for their bathrooms. The collection is completed by shelves, various towel racks, wall lights, lotion dispenser, toothbrush tumbler, and products for the WC. Axor Citterio M kitchen mixers feature a high spout with individually adjustable swivel ranges of 110, 150 and 360°. The versions featuring a hand spray also offer two different jet types: normal and shower spray. The separate lever handle can be custom-installed in the area around the sink – for example at the back, well away from the reach of children, or on the left-hand rim, ergonomically practical for those who are left-handed. Which wash basin matches Axor Citterio M?